Tempo Traveller considers a perfect tourist vehicle for a group Tour Package. 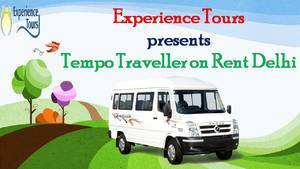 Experience Tours is providing Tempo Traveller on Rent service from Delhi since 2010 with a budget price. We provide our Tempo Traveller Rental service from Delhi to local sightseeing, outstation trips, holiday Package and family Tour Packages. We charge very affordable price for our service and give you a wonderful service. Our all drivers are well trained and educated who can communicate with you in many languages for a better communication. We promise to you that you will get an amazing service by us and never forget it.